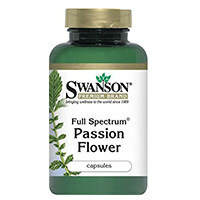 This is our list of the best selling passionflower supplements on the market right now. These 10 passionflower brands have been ranked because they dominate the e-commerce sales charts, fitness bloggers love them and they have the highest user reviews online. 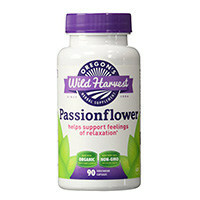 If you’re looking for an organic Passionflower product that’s Certified Organic and Non-GMO verified, consider these capsules from Oregon’s Wild Harvest. They contain only the finest passionflower tops for a product that’s pure and manufactured to the highest quality standards. When you open the bottle, the distinctive scent is a testament to the purity and freshness of the capsules within. 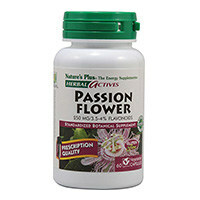 For natural relief of stress and tension, consider this Passion Flower Extract supplement from Now Foods. This standardized 3.5% extract may also help with insomnia when taken at night. This supplement contains 45 servings in each bottle. Whether you use this supplement during the day, at night, or both. Since 1972, Nature’s Answer has provided high-quality supplements using advanced botanical fingerprint technology. These Passionflower capsules are standardized to contain 3.5% to 4% Isovitexin flavonoids, and are made with cruelty-free manufacturing processes. Quality is assured through more than 100 quality control checkpoints, which are conducted during the production process before any product reaches the market. Solaray is a company that’s been recognized by Whole Foods for their quality supplements. All products adhere to Good Manufacturing Practices, and the company uses only the finest natural ingredients in all of its products. Solaray supplements must undergo rigorous quality testing for purity and safety, so you know you’re getting a supplement you can trust. 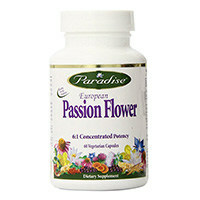 This Passionflower supplement contains 100 capsules per bottle. 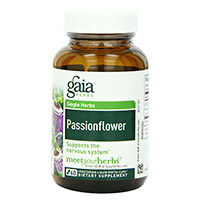 This passionflower extract from Gaia Herbs is suspended in an organic alcohol base. All of the alcohol-based extracts from this company are USDA Certified Organic, so you don’t have to worry about pesticides or other unnatural ingredients in your supplement. Extracts are especially good for individuals who don’t like to swallow pills; in addition, extracts work more quickly because there’s no capsule to break down. Puritan’s Pride is one of the most well-known supplement manufacturers, and for good reason. This company has a long history of producing high-quality products. This Passionflower extract is made with a proprietary Bio-Chelated extraction process that gives an advanced botanical footprint that’s holistically balanced. The result is a potent Passionflower supplement that’s all-natural. Swanson Health Products is a company that adheres to Good Manufacturing Practices. They use contract and in-house labs to perform rigorous tests for quality and potency of all their supplements. In addition, this company has been awarded with the designation of Top Rated Catalog/Internet Brand based on customer satisfaction. Their Passionflower capsules are made with the whole herb; other ingredients include gelatin and cellulose. Paradise Herbs uses an extraction method that’s totally natural, which means you get all the active constituents of the plant. This product adheres to the requirements of the German Commission E Passion Flower herb monograph, in addition to the French Pharmacopoeia. 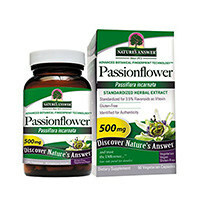 These Passionflower capsules from Nature’s Plus is standardized to contain 3.5% – 4% active flavonoids. This supplement is made so that each capsule contains synergistic compounds from the whole flower for optimal efficiency. The HerbaShield system by Nature’s Plus protects the integrity of this supplement with a light-resistant bottle, tamper-resistant cap, airtight seal and moisture-absorbing inner packet. 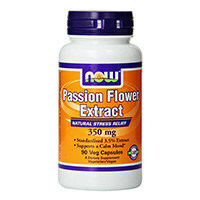 If you’re seeking a potent Passionflower supplement in capsule form, check out this product from New You Vitamins. 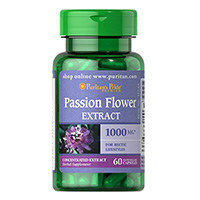 These capsules are made with 10:1 Passionflower extract and are preservative-free for quality. There are 90 capsules in each bottle, making this supplement a good value. Native to the southeastern U.S. and also cultivated in Europe, Passionflower (Passiflora incarnata) is a climbing vine that can reach 32 feet. It was first discovered growing in Peru in 1569 by Spanish explorers, who gave the plant its name to honor the “passion of Christ.” The vine boasts distinctive blossoms that are white and bluish-purple with yellow accents. Other names for passionflower include passion vine, maracuja, apricot vine and purple passionflower. The plant produces fruits that are approximately the size of an egg and called maypops. The above-ground parts of Passionflower — the stems, flowers and leaves — are harvested and dried for medicinal use. In addition to being used internally, this flower is also sometimes applied externally to relieve inflammation and pain from burns, abrasions and hemorrhoids. All Passionflower supplements are not created equally. Before spending money on a botanical supplement, it’s important to do some research and ensure you’re buying a product that contains the right amount of the active ingredient. While price can sometimes be an indication of the supplement’s quality, it’s not the only deciding factor to consider. Check supplement labels for the Good Manufacturing Practices (GMP) designation, which indicates that quality-control measures and tests are performed to ensure a high-quality product that you can trust. Another way to determine the best Passionflower supplements is by reading consumer reviews — just make sure the reviews are impartial and posted on a trustworthy site. Consulting with your doctor or an alternative medicine professional can also help you choose the right product. You’ll find that many products have the same features. Before shopping, make a list of the most important factors that you’re seeking in a passionflower supplement. Do you want something that’s Non-GMO and Certified Organic? Are you looking for a low dose of passionflower or do you want to try something potent? By knowing what to look for ahead of time, you can save time and hassle. Passionflower is available in a variety of different forms; one isn’t better than the other, it’s simply a matter of personal preference. Capsules are a popular way to take Passionflower — check the label to determine how many capsules you’ll need to take to get the preferred dosage. The dried flowers can also be steeped in boiling water for about 10 minutes. Use about 1 tsp of herb per 6 to 8 ounces of water, and drink up to 4 cups daily. The tea can be sweetened if desired — opt for organic honey or stevia for best results. Passionflower tea can be taken 30 minutes to 1 hour before bed to alleviate insomnia. If you prefer a liquid supplement but don’t want to drink tea, consider a tincture. Take 10 to 45 drops three times daily in a small amount of water or other beverage; you can also take tinctures straight, although the taste may be a bit unpleasant. Simply drop the tincture onto or underneath the tongue with the dropper that comes with the product. Many people prefer tinctures because the active ingredients are delivered to your nervous system more quickly. If swallowing large capsules is an issue, try a tincture or extract. Tinctures are made with alcohol, while extracts can be made with either alcohol or glycerin. If you prefer to avoid alcohol, go for an extract. They still work quickly and are taken the same way — although most package instructions say to take liquid passionflower in water, you can substitute any beverage that you prefer. Individuals with medical conditions or those on prescription or over-the-counter drugs should consult with their doctor before taking any supplement. There can still be interactions with other medications that may be harmful. Pregnant or nursing women should not take passionflower without medical supervision.